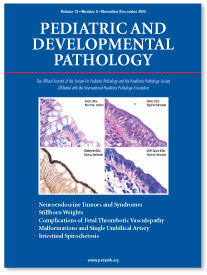 Pediatric and Developmental Pathology is the premiere journal dealing with the pathology of disease from conception through adolescence. It covers the spectrum of disorders developing in-utero (including embryology, placentology, teratology), gestational and perinatal diseases, and all disease of childhood. In addition, the time-honored publication, Perspectives in Pediatric Pathology, was incorporated into the regular content of the new journal in 1998. This group of articles provides scholarly and comprehensive treatment of a specific topic, with historical data, current information, and the author's perspective (see below). A section entitled "Current Practice in Pediatric Pathology" describes the latest advances in the fields of pediatric surgical pathology such as Wilms tumors, neuroblastomas, and germ cell tumors. 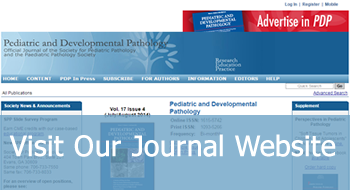 The editorial board reflects the broad geographic and scientific representation from all areas of pediatric pathology; the Society for Paediatric Pathology and the International Association for Pediatric Laboratory Medicine are both affiliated with the journal. Perspectives in Pediatric Pathology is a living textbook, providing a comprehensive treatment of specific topics germane to pediatric pathology. Six articles are published yearly and incorporated into Pediatric and Developmental Pathology. There is also an annual compilation of the articles, combined with biographical sketches of the founders of pediatric pathology. 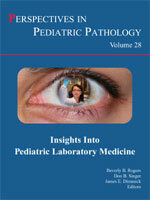 Editors for Perspectives in Pediatric Pathology are Dr. Don Singer,Dr. Jim Dimmick and Dr. Beverly Rogers. Prior to 1998, Perspectives in Pediatric Pathology was published as a yearly bound volume alone.